"I always sleep on my side and one night I experienced a sharp pain there. Thinking nothing of it I moved onto my back and felt fine. As time went on I started to experience shooting pains and that pain in my side became more consistent; it felt like an internal swelling but I still didn't take it seriously — cancer certainly never entered my head. I was used to that kind of pain as I’d had a lifetime of painful periods and just wished for them to end....that taught me to be careful for what I wish for! It was mid-June, about six weeks after I’d first noticed it, that the discomfort became consistent. It wasn't until July when I started to diarise symptoms: tender when I breathe in, shooting pains down my right side, throbbing pain in girlie area and discomfort in my side starting to feel tight. I started to experience the shooting pains about four times a day and finally made an appointment to see the doctor. I had a really busy job and my family was dealing with the emotions of moving my mum into a home as her Alzheimers progressed. As you can imagine life was quite stressful and I put caring for others before my own health. I waited two weeks for an appointment as I wanted to see a female doctor. Late July I met Dr. Scott and thankfully she took my symptoms seriously; my 10-minute appointment lasted 40 mins whilst she did a thorough examination. All blood and tests came back clear! The only thing I had to wait for was an ultrasound. I waited patiently for my appointment to come through from the hospital but it seemed to be taking forever. In the meantime I returned to my GP for pain management who gave me pain relief and tablets for IBS (which never worked, so I knew it wasn’t that). Would you believe me if I told you that I then went on to do a 26-mile charity walk along Hadrian's Wall on 13th August and another one 10 days before diagnosis in London. I found that walking helped relieve my symptoms. My ultrasound appointment finally came through — six weeks after my original GP appointment. By now walking had become tricky and I noticed my clothes were becoming tight. They told me that they could see a growth on my ovary and fluid on my liver. It sounds silly but I was just relieved they’d found something and I thanked them for it! They advised me to make an urgent appointment with my GP, which I did. Cancer still hadn’t entered my head; I was now thinking cyst. 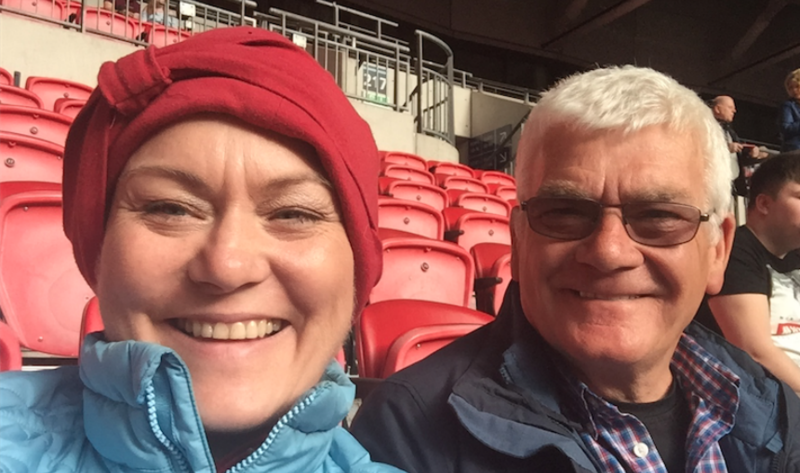 "This is the trouble with the disease in my view; the symptoms feel minor and before having it I’d never really heard of ovarian cancer." My diagnosis was quite straightforward once I had the ultrasound and the next day I was sent for a CA125 blood test and at 2043, it was suggested that it could be cancer (a normal level is less than 35). On 21st September 2016 my consultant gynaecologist diagnosed me with stage 3c/4 high grade serous, which was later revised to 3c, following further tests. It was the time it took to get the ultrasound that still bothers me. Had the scan been earlier perhaps my cancer could have been caught at an earlier stage. But having said that, I didn't help myself by taking my time in getting myself to the doctor in the first place. This is the trouble with the disease in my view; the symptoms feel minor and before having it I’d never really heard of ovarian cancer. My consultant admitted me the next day into hospital and he advised me that the priorities were to drain my ascites, to do a biopsy and start my chemo. They drained five litres of ascites from my tummy, leaving me 7lbs lighter! I was advised by friends to accept any trial I was offered and I did. I was then referred to Mount Vernon Cancer Centre a couple of weeks later (my CA125 level now almost 5000) where ascites was drained again and I was offered the chance to participate in the ICONB8 trial. This meant I had three cycles of Carboplatin and weekly Pacilaxel before and after the operation. I’ve been quite lucky with side effects and was only sick on my first dose. Apart from hair loss I coped well with treatment, although I remember my skin peeled in the early weeks which was a bit horrid. Having said that, at the time of writing this I am eight months post-surgery and I have been admitted into hospital five times in four weeks for obstructions in the small intestine, resulting in acute sickness and the most awful stomach cramps. Until this week I was being fobbed off that the obstructions were being caused by my scar tissue (adhesions) however I had a CT scan and on Wednesday I was informed the cancer has returned to my intestines and there is nothing more they can do for me except make me comfortable. I was not expecting to be told this horrid news. I'll see my oncologist next week where hopefully more chemo will be an option. I still have the strength to give this cancer another kicking! I’m not one for planning but I returned to work straight after last treatment and I put things in my diary to look forward to, especially spa days as I get tense. I've given up work now and I will have fun for as long as my body allows me to. I intend to live with my dad now so he can take care of me; he has been amazing. Could you look after your wife with Alzheimers and a daughter with terminal cancer? The man deserves a big medal! I am supporting Ovarian Cancer Action as I strongly feel the answer lies in research for a screening test and a cure."